Do you enjoy science fiction? Many science fiction fans have rallied around shows like Star Wars and Star Trek, insomuch that they have their own days! May 4th is Star Wars Day and it’s the perfect opportunity to celebrate your love of the Star Wars universe. 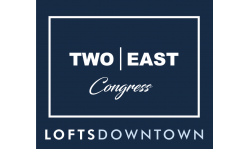 In this week’s Two East Congress Blog, we’ll share with you some ways you can celebrate and make the most of the day! There are lots of movies in the Star Wars saga, many of which take place during different time periods. Whether you wish to watch them all in chronological order or whether you wish to watch your favorite ones, you’ll have hours of entertainment ahead of you. Grab some friends and get yourself ready for a marathon! Don’t forget the delicious snacks either. Snack on some tasty treats during your marathon by making some delicious Star Wars inspired treats! From pretzel lightsabers to macarons decorated like your favorite characters, there are plenty of treats you can choose from to make your movie marathon better! Show your classmates or coworkers your love of Star Wars by participating in some casual cosplay! Pick your favorite character from the movies or universe and dress up like them! Some of the most popular characters to cosplay are Han Solo, Luke Skywalker, and Princess Leia. If you wish to participate in more serious cosplay, you can choose a different, more complex character like Chewbacca or even C3P0. Don’t be afraid of what people think; be you and don’t be afraid to show off what you like! We hope you enjoy your May the 4th by using some of our suggestions! If you’ve got other suggestions, let our Tucson, AZ apartment community know of them by leaving us a comment! Thanks for reading! Sorry, not dogs but we are cat friendly.